Welcome to our home! I have chosen to share the foyer and extended entry to our home first. Three arches and pendants draw your eye toward the window into the forest beyond. One of the reasons we chose this plan was this architectural feature. 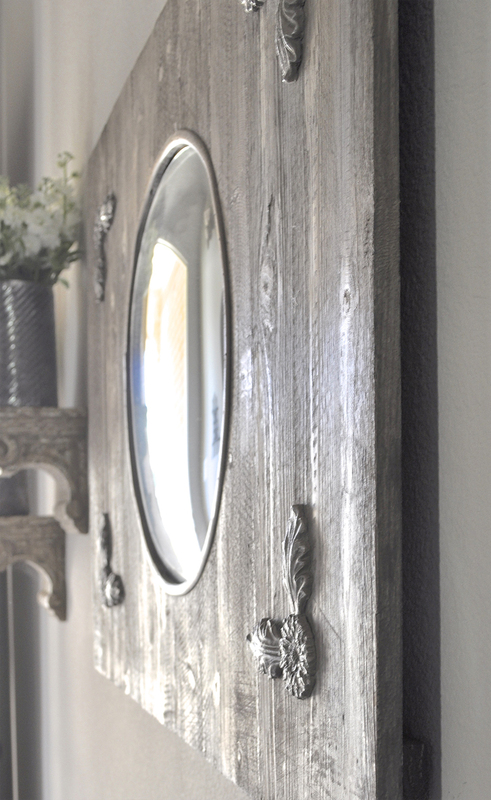 A bench and a mirror collection fill the wall and provide an introduction to our style. You will notice a variety of different sizes, shapes and textures. You will often find fresh flowers here which I find welcoming and relaxing. And this is exactly how we want our friends and family to feel when they visit our home. 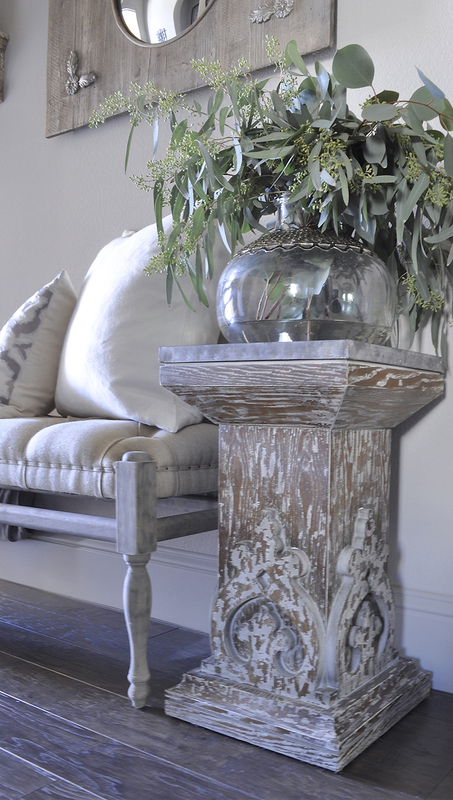 Nature truly has provided us with the greatest gifts and this eucalyptus adds a fresh scent. As you are about to enter the family room, one final bit of intrigue in the extended entry catches your eye. A wall-mounted side table provides the foundation for this space. I will routinely reinvent this space throughout the year. 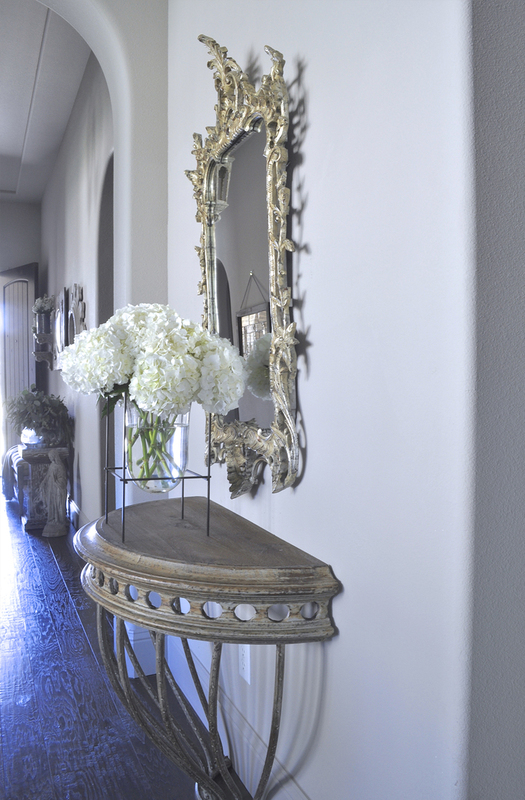 Today, fresh hydrangeas and an ornate mirror from our first home in California provide a simple yet interesting combination. From this angle, you begin to truly see the entire flow of the foyer and extended entry of our home. The varying textures and patterns, including the wood flooring work seamlessly together to offer a soft and inviting passage with a touch of masculinity which is provided by the hanging lanterns. However, it is the three distinctly different floral arrangements which tie it all together by providing balance and enhancing the space with a bit of personality. Thank you for visiting! We hope you will return to tour the rest of our home in upcoming weeks ahead. We are excited to share this journey with you all and look forward to a very exciting introductory year for this blog. *Some affiliate links have been used. Now that you are here, I hope you will stay! 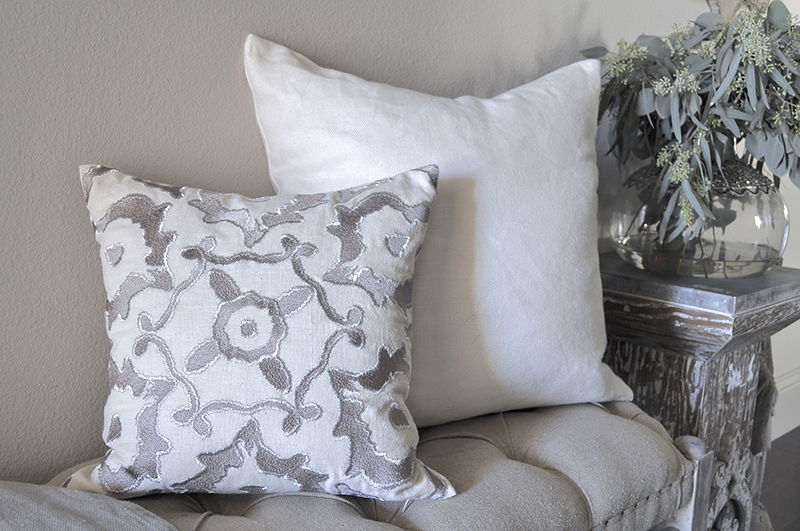 You can find additional room tour on my Home Tour page. 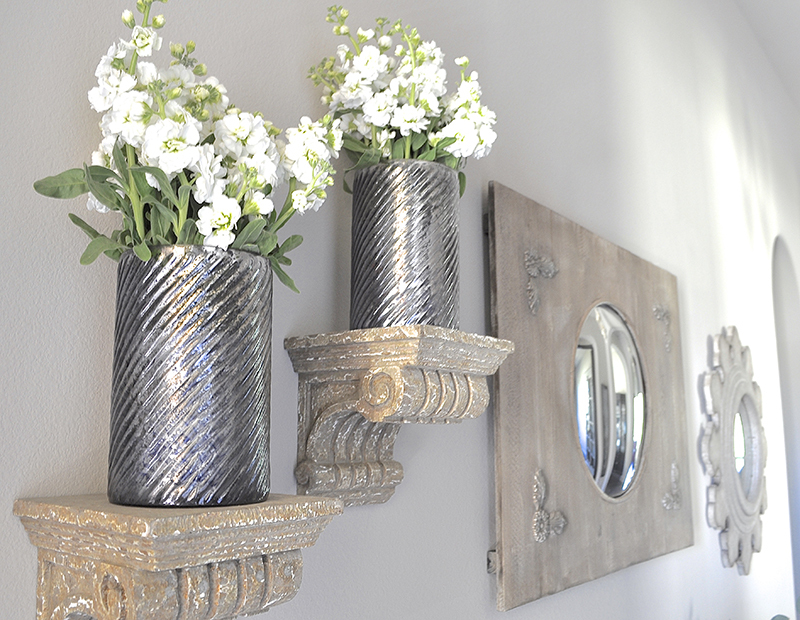 « Welcome to Decor Gold Designs! 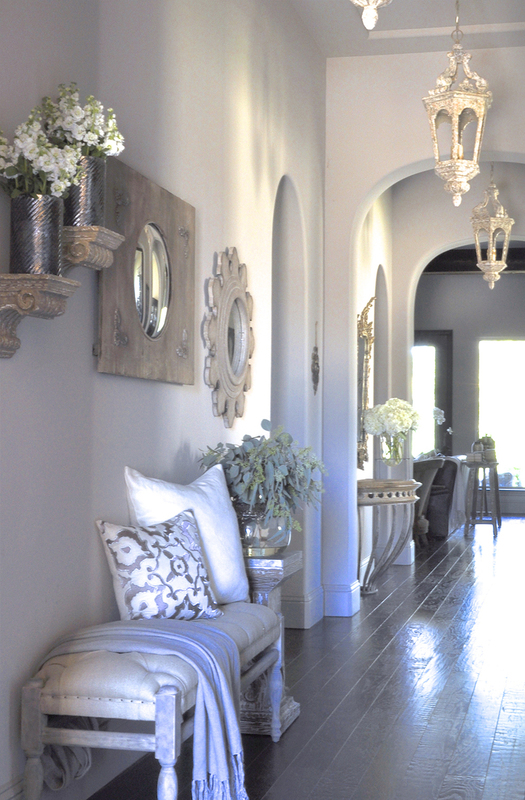 Your entry hall is so perfect! Love it all! Keila, thank you so much! You are such a sweetheart and a favorite friend on Instagram! I truly appreciate your kindness today and always! And thank you for your sweet text this morning! So beautiful Jennifer!! You did good!!!! Thought I had already commented on this but I guess I didn’t…so sorry! Wow! Just wow! This space is even more beautiful than I imagined, Jen!! Such lovely details as you enter your gorgeous home😍 Love it all!! Thank you so much Charlotte! I’m so glad you like took a moment to visit and I will try not to disappoint with the next room tour!!! xoxo Good luck starting your blog! Thank you so much Leslie! I can’t wait to see your house when it’s finished. Your home is beautiful. Would you mind sharing information on your flooring choice? Brand and color. Thank you! The brand is Shaw, but the color has been discontinued. Sorry!! Thank you! The brand is Shaw. The color been discontinued, but perhaps they have something similar. 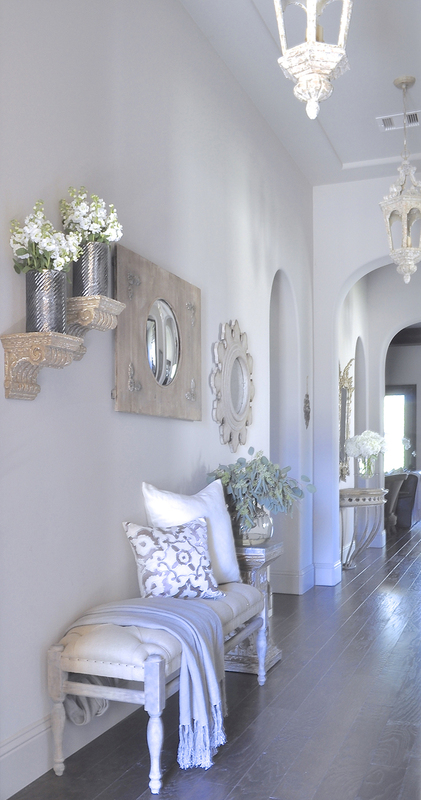 Love your home ~ Can you please tell me the brand and color you use on your walls throughout your home? Just stunning! Hello again! Thank you so much for your kind words about my home. I sent you some details on a previous message, but the paint is custom.